Couch potato. 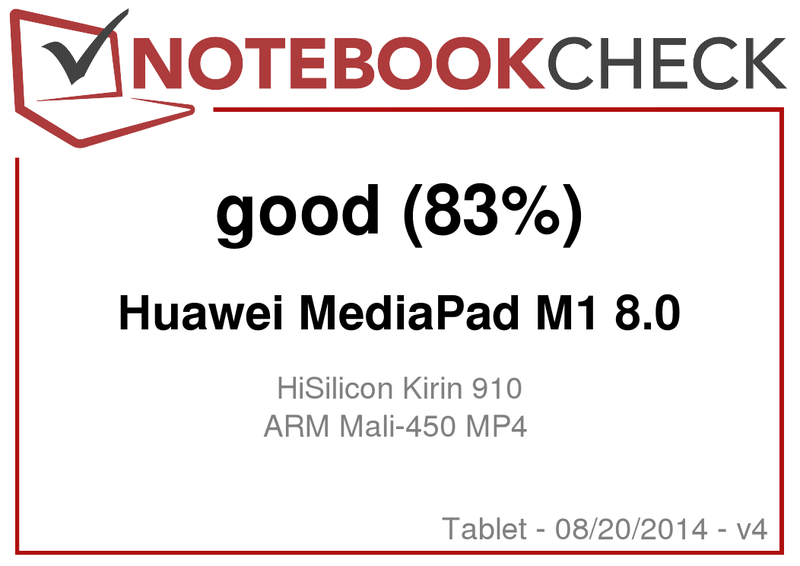 The MediaPad M1 8.0 ships with a fast Kirin 910 CPU, a decent display and great battery runtimes - but while its stamina may be great, both its slightly outdated version of Android and some outdoor usability issues are disappointing. However, for less than 200 Euros (~$263), it is still a good offer. 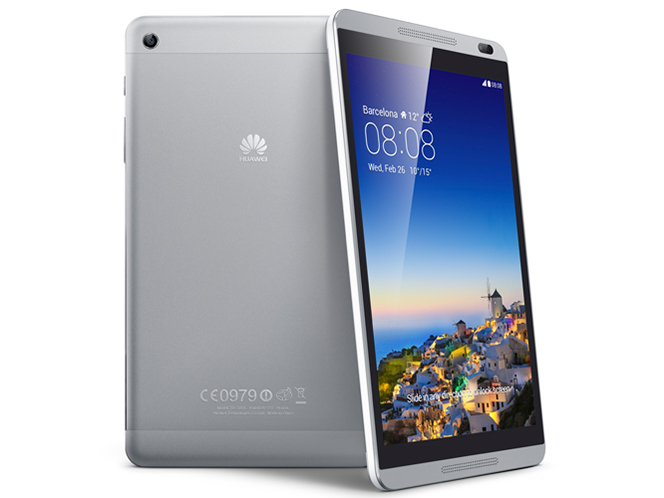 The Huawei MediaPad M1 8.0 is a comparably affordable 8-inch tablet, being priced at a reasonable 229 Euros (~$302). 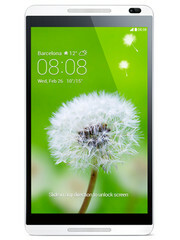 It comes with an HD resolution IPS screen and a quad-core CPU designed by the Chinese company itself. The 16 GB of storage can be expanded with the help of micro SD cards, and an optional LTE variant is available as well - although our test device has to do without a cellular modem. Premium tablets such as the iPad Mini (starts at 389 Euros, ~$513) are definitely no direct competition due to the large price differential. 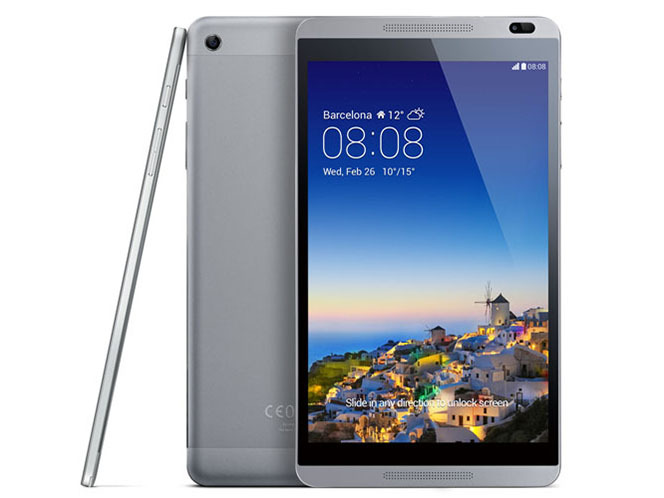 Some manufacturers other than Apple do, however, produce more affordable slates, including the Samsung Galaxy Tab 3 8.0 (starting at 178 Euros, ~$234), the Lenovo A8-50 Tablet (140 Euros and up, ~$184), the Acer Iconia A1-810 (135 Euros or more, ~$178) and the Windows-based Dell Venue 8 Pro (at least 200 Euros, ~$263). Slim design and decent build quality. The chassis of the Huawei MediaPad M1 8.0 is made from plastic and metal. Weighing 341 grams and measuring 7.9 mm in thickness turns it into one of the slimmer tablets of its class. In addition, the bezels on its long sides are quite slim. When used in portrait mode, it can easily be held with one hand. The rear part is dominated by a metal surface with some plastic parts around the camera and at the opposite side. While these come in a similar color (at least for the gray model), its clearances are somewhat uneven. The lower plastic part comes with a small latch allowing it to be removed (albeit only with a lot of force and caution at the same time, as it sits very tight while being quite fragile). Beneath, the micro SD card slot and the SIM card slot (for the LTE variant only) can be found. The display frame is made from plastic with a metal look. 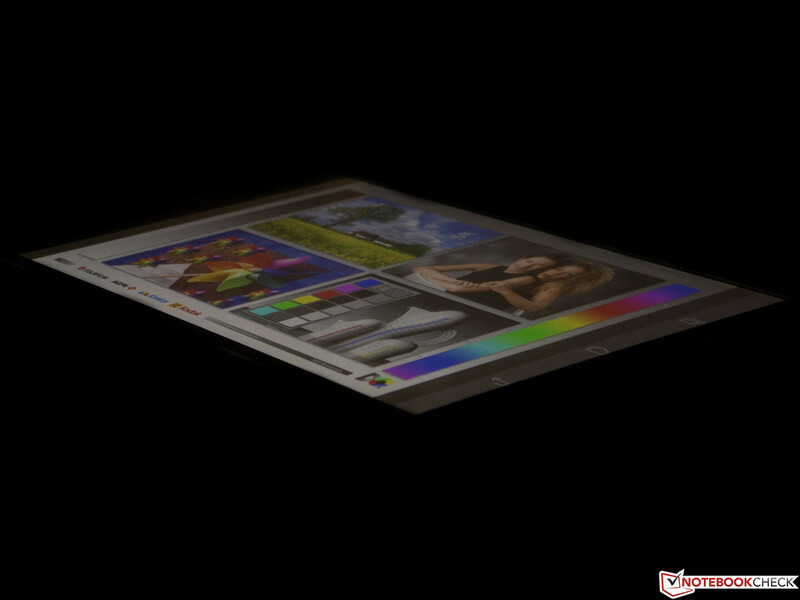 The tablet is very torsion-resistant and also quite pressure-resistant, with only a lot of force being applied to the rear leading to image distortions on the display. The battery cannot be replaced or exchanged by the user, being soldered to the device. 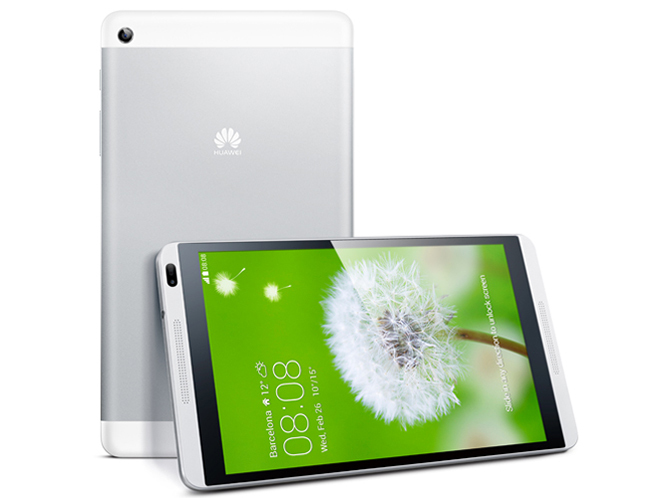 The micro-USB 2.0 port of the Huawei MediaPad M1 8.0 supports both recharging and data transfer standards in addition to OTG, allowing for external input or storage devices to be connected to the tablet. The micro-SD card slot allows cards with up to 32 GB of storage to be used with the device. The M1 is also capable of supporting App2SD, making it easy to move apps to the micro-SD card (we experienced no problems when testing this feature). 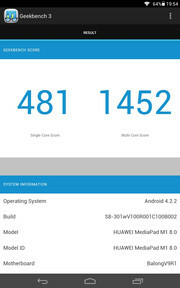 The tablet ships with a slightly outdated version of Google's OS, Android 4.2.2 Jelly Bean. 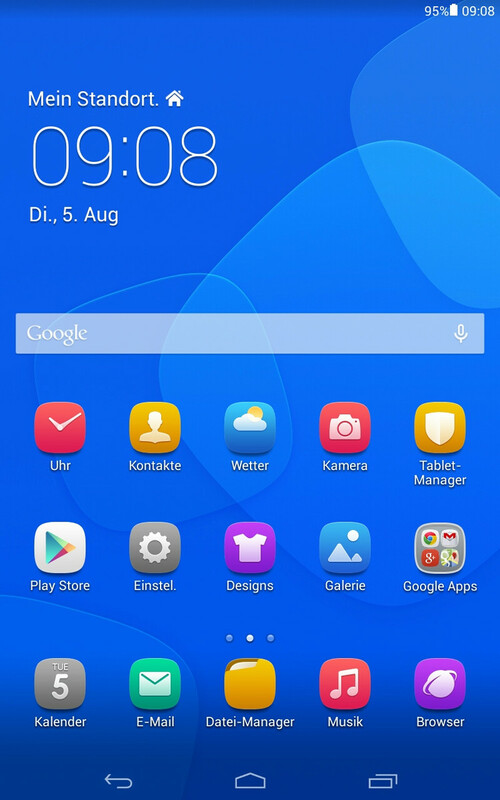 It is augmented by Huawei's own Emotion UI as well as some tools (App2SD and a tablet manager which comes with clean-up functionality for the system and its storage as well as allowing for access to recovery and energy-saving features), but with the exception of Kingsoft Office, no third-party software is on board. 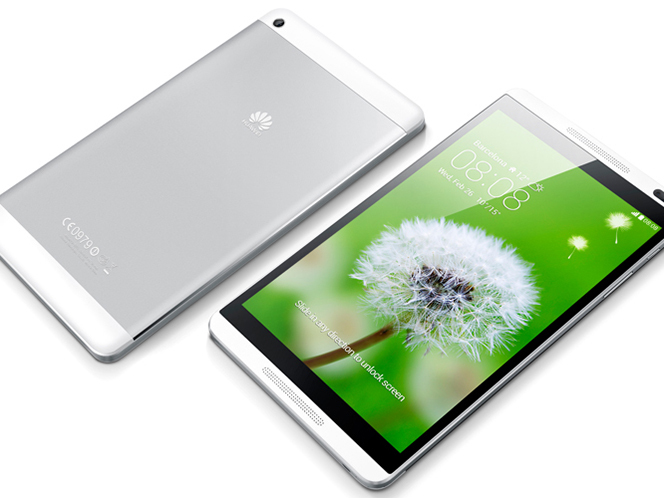 The Wi-Fi module of the Huawei MediaPad M1 8.0 supports the IEEE-802.11 standards a/b/g/n, making it capable of using both the 2.4 and 5.0 GHz bands. Range is sufficient, but not great. 20 meters away from the router (a Fritz!Box 6360), connection quality wasn't great, with a dampening amplitude of -86 dBm, but it was still enough to browse the web. 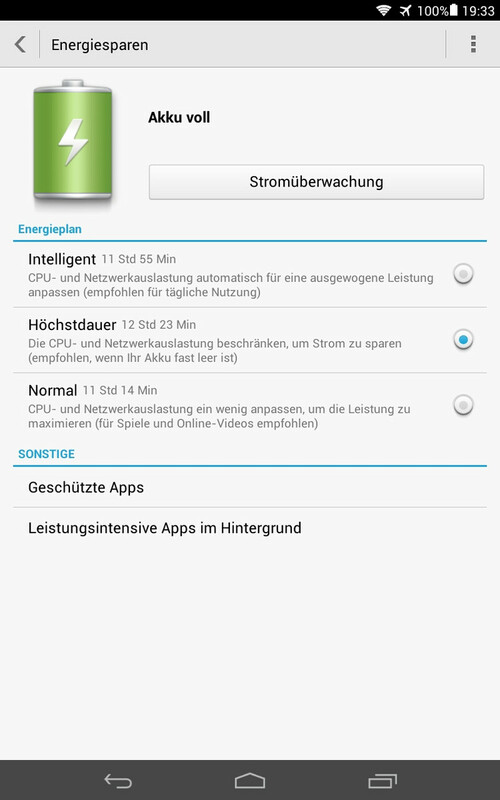 While NFC has been omitted, Bluetooth 4.0 is also on board, working flawlessly. Even when streaming HD videos from the web to the tablet, audio playback on an external Bluetooth speaker shows no latency. The GPS module works reliably. 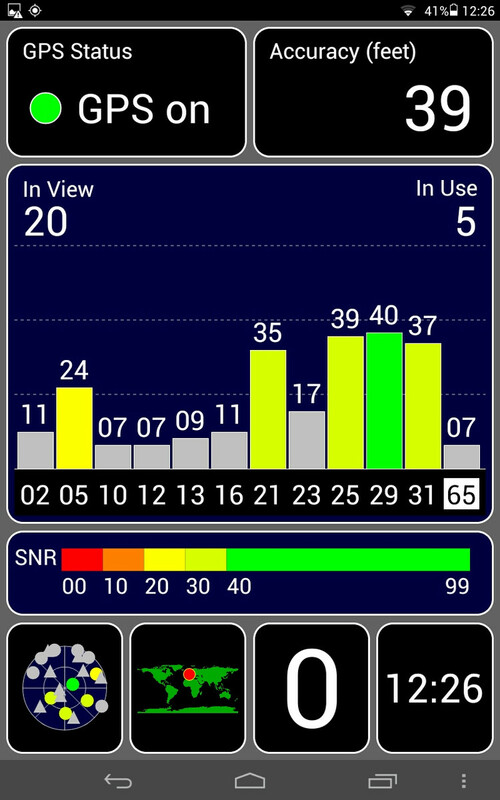 While it takes a bit to find our location indoors, it locks onto us within a few moments when being used outdoors. 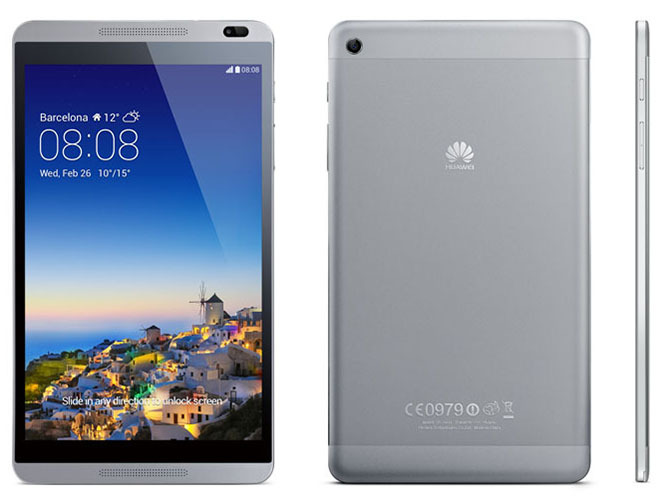 The Huawei MediaPad M1 8.0 ships with two cameras. The webcam on the front yields 1 MP (1280x720 pixels, 16:9), being good enough for video chats under well-lit conditions. 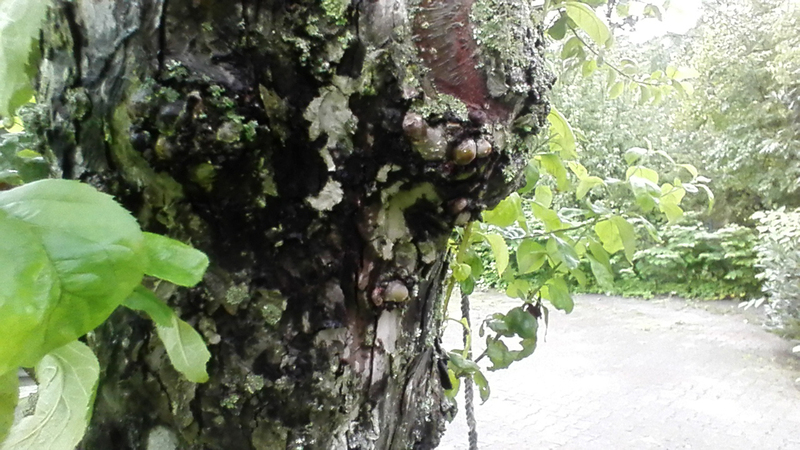 Photos, however, look less life-like, appearing dull and grainy with unnatural colors. 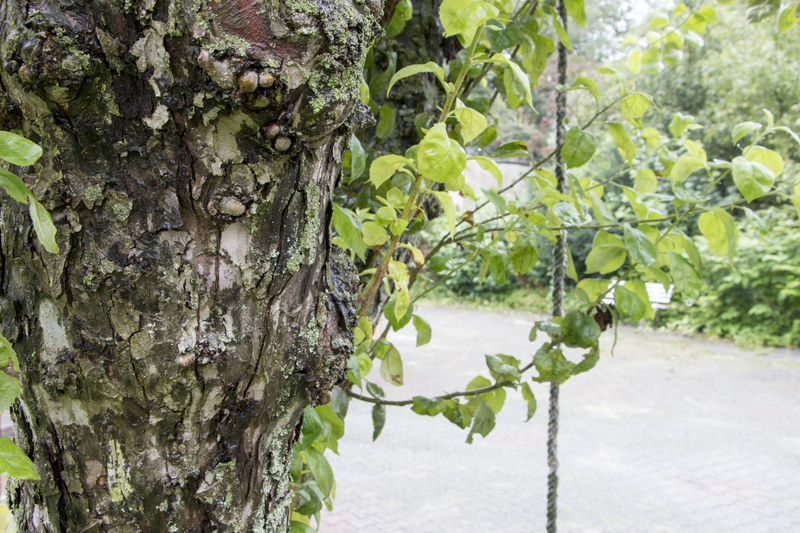 The main camera on the rear yields 5 MP (2592x1592 pixels, 4:3) as well as auto-focus capabilities. During daylight, sharp photos can be taken - although color reproduction is decent at best, with a lot of oversaturation. Under less favorable conditions, quality is far worse. An LED flash would have been nice for these instances. Videos can be recorded with 1280x720 pixels ("small" HD), not very much in times of UHD. Quality is so-so, too, with a lack of sharpness and a lot of noise in addition to mediocre audio quality. The MediaPad ships with just a modular power adapter yielding 10 watts (5.0 volt, 2.0 ampere), a USB to micro-USB cable, a warranty card and a printed quick-start guide. 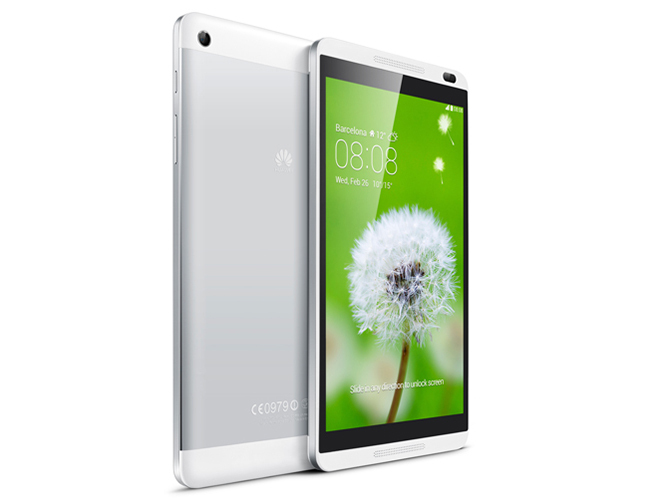 Huawei offers no special optional accessories for the MediaPad M1 8.0. 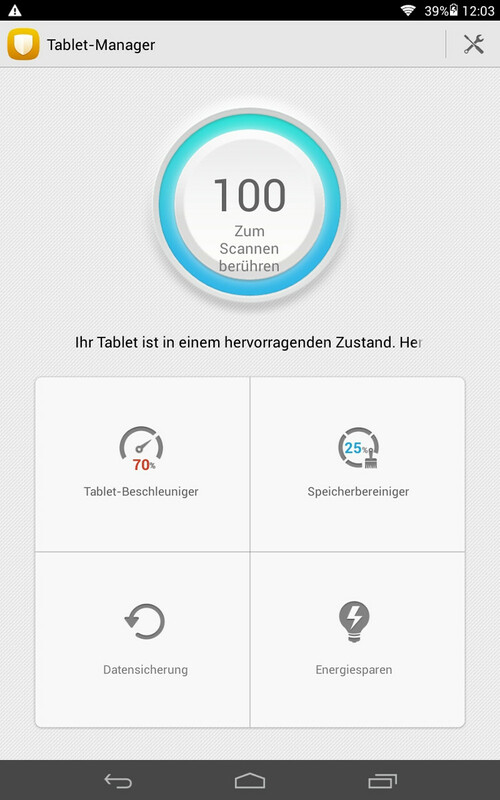 The tablet comes with 24 months of warranty, including 6 months for the battery and the power adapter. 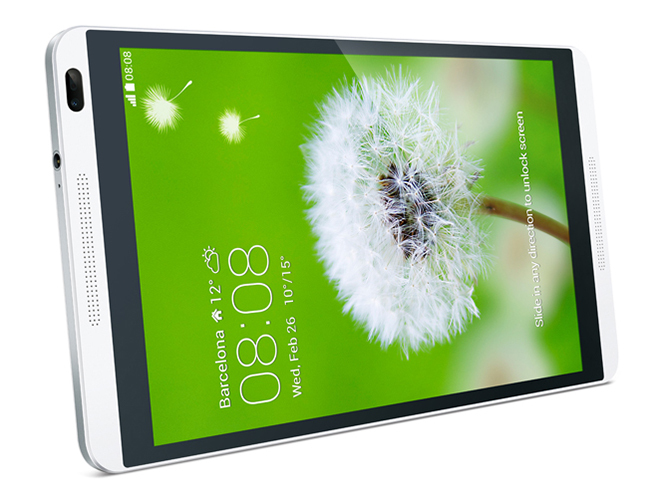 The 8-inch capacitive touchscreen of the Huawei MediaPad M1 8.0 recognizes up to 10 fingers at the same time. Unfortunately, while it works reliably, quickly and with great precision, its plastic surface doesn't feel smooth enough to lead to a comfortable swiping and gliding experience. 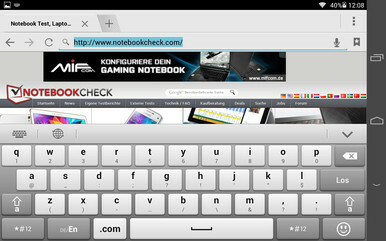 The Android keys are rendered as on-screen buttons. Huawei's keyboard layout is quite minimalistic, coming with large keys. Unfortunately, the keyboard doesn't remember its language settings forcing the user to switch e.g. from English to German each time. The volume rocker and the power button are the only physical buttons. 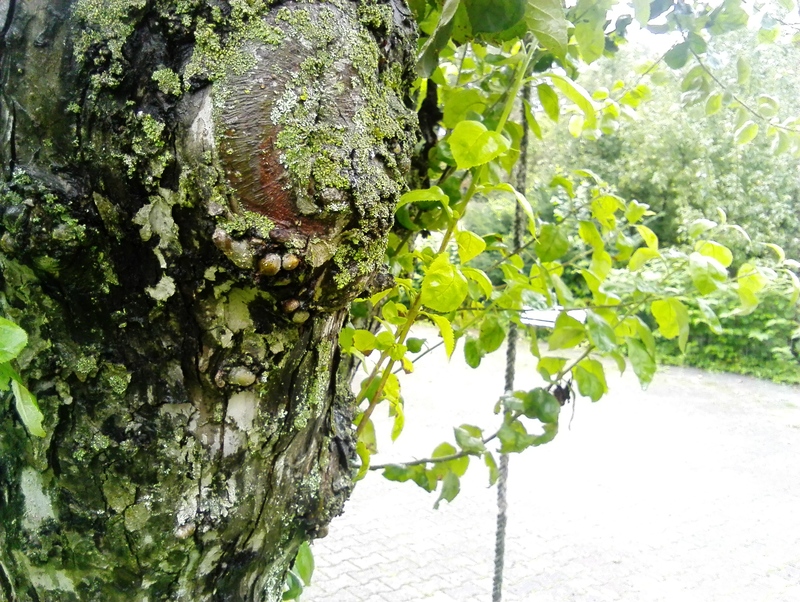 They are easy to feel, but their pressure point is not very well defined. 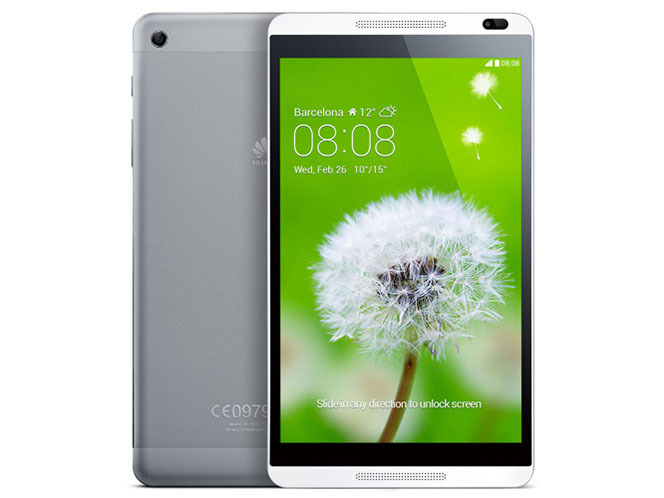 The 8-inch display of the Huawei MediaPad M1 8.0 comes with a resolution of 1280x800 pixels and thus a screen ratio of 16:10 and a pixel density of approx. 189 ppi. While this may not be absurdly high, it is both sufficient and standard for this market segment. 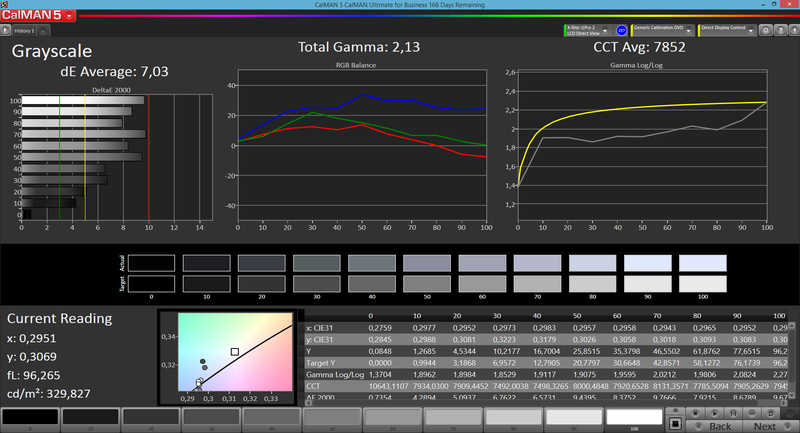 The tablet reaches a maximum brightness of 328 cd/m², another common value for this segment, and another decent one. 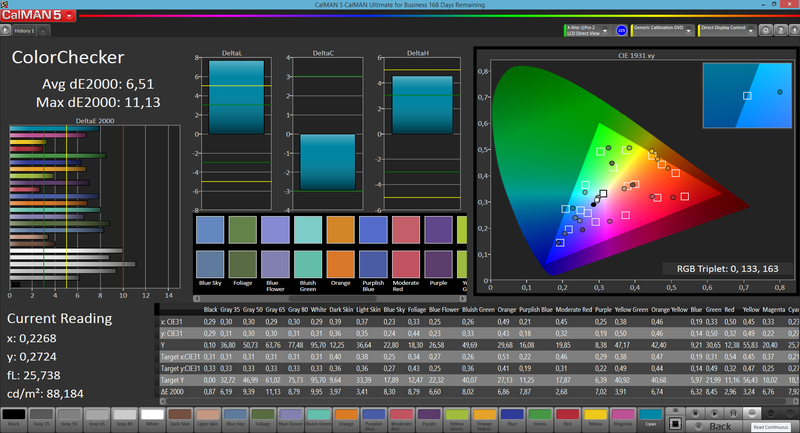 Still, brightness homogeneity is below average, coming in at 84%, although barely any noticeable brightness differences occur during actual usage. The Huawei MediaPad M1 8.0 yields decent black levels of around 0.46 cd/m² (and thus darkish blacks) and subsequently a good contrast ratio of 713:1. 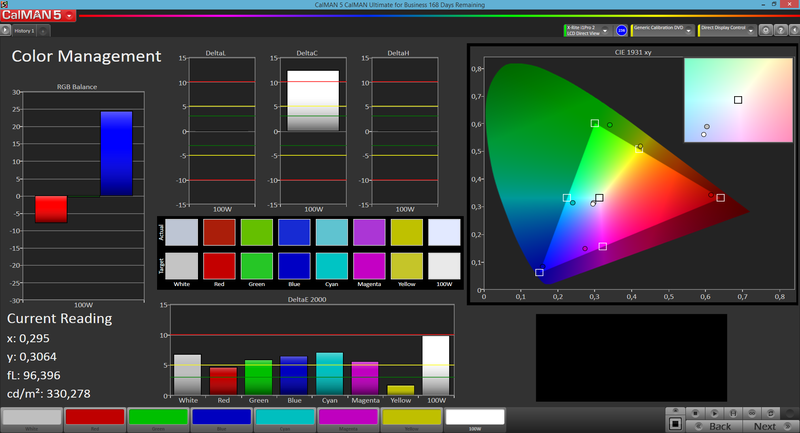 Colors come to lie on the cool side, although this can be changed manually in the settings menu. 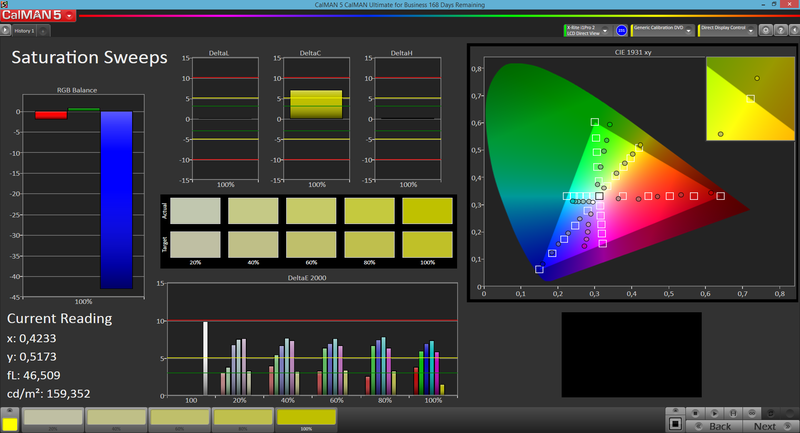 The resulting dE values (for a medium color temperature value) are a lot better, removing most of the strong bluish tint of the display without being capable of getting rid of all of it. Thus, we have taken two measurements of the panel, one with the standard settings and another one with the changed ones. During the latter scenario, lower dE values of 5 (grayscale) and 6 (mixed colors) result. Generally speaking, colors could be more vivid - something which becomes much more noticeable when comparing the Huawei MediaPad to other devices. Unfortunately, while it works flawlessly in closed quarters, the Huawei MediaPad M1 8.0 is not very well suited to outdoor usage despite of its decent brightness and high contrast ratio. It is still too dark, making it hard to see anything even when the sky is cloudy. The glossy, highly reflective surface increases this problem. 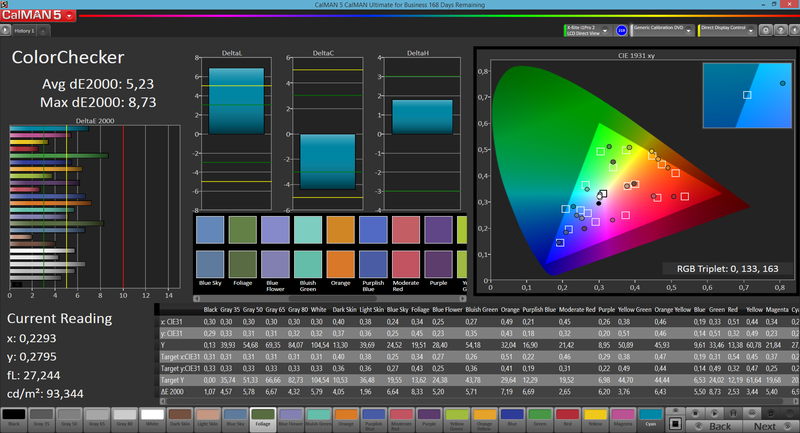 In terms of viewing-angle stability, the IPS display is very good, with the only issue being the glossy surface. 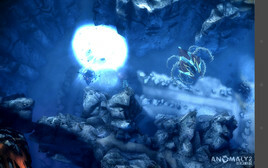 Even brightness barely decreases under steep angles (although a slight ghosting effect does occur beyond 130 degrees, but this shouldn't be an issue under real-life conditions). The MediaPad M1 8.0 in cloudy conditions. Viewing-angle stability of the MediaPad M1 8.0. 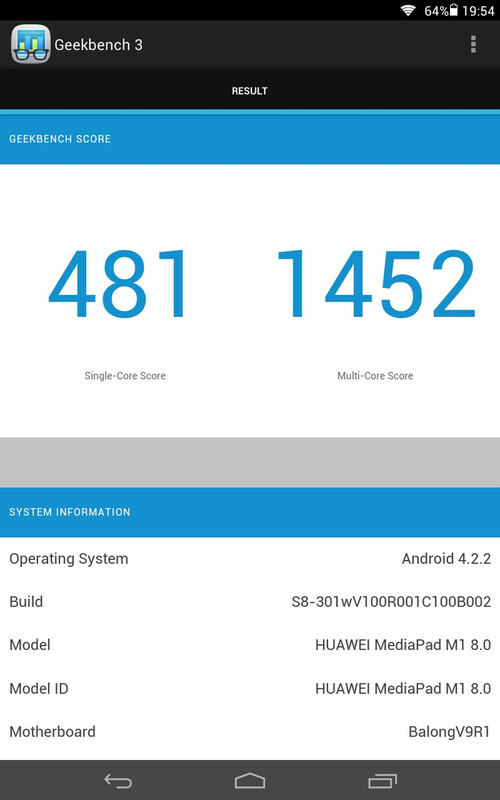 The Huawei MediaPad M1 8.0 ships with a home-grown CPU, the HiSilicon Kirin 910, a quad-core SoC with a CPU clock speed of up to 1.6 GHz, making this a slightly slower variant of the otherwise similar Kirin 910T (1.8 GHz). 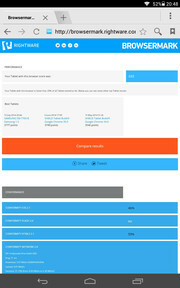 The integrated mid-range ARM Mali-450 MP4 GPU clocked at 533 MHz leads to more-than-decent graphics performance. Quite often, the system will not work flawlessly, with a number of lags - quite a surprise given the decent specs. Most likely this is the fault of the Emotion UI. Possibly, the rather sluggish flash memory (faring worse than that of its competitors) might have an influence on these results as well. 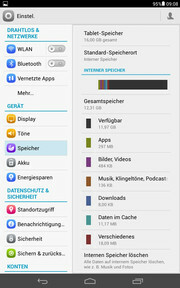 12 GB out of 16 GB remains, but micro-SD cards of up to 32 GB can be inserted, reducing this issue. Browsing the web is almost always a smooth experience, but even here, some lags can be observed on more demanding websites. 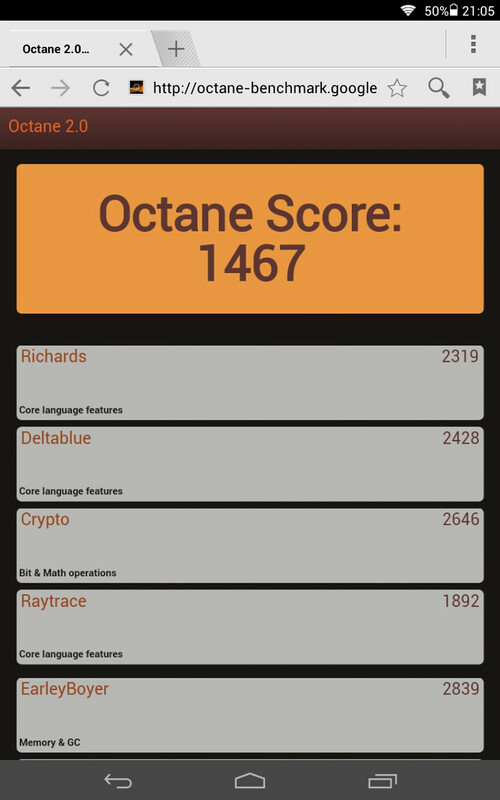 Although the ARM Mali-450 MP4 does not support OpenGL ES 3.0 (only the outdated 2.0 standard), it is nevertheless capable of rendering most games smoothly, making playing games feasible on the Huawei MediaPad M1 8.0. 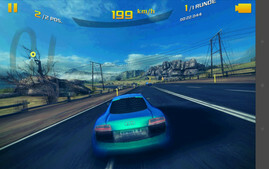 Only more demanding titles such as Asphalt 8 or Anomaly 2 will require the user to reduce details in order to yield a smooth gaming experience. The sensors work perfectly well, making it even more fun to play. However, the touchscreen could feel more comfortable to slide across with one's fingers. The surface temperatures of the Huawei MediaPad M1 8.0 remain unproblematic at all times, never exceeding body temperature, with up to 31.8 °C while idle and no more than 36.6 °C under continuous load for more than one hour (as simulated with the app Stability Test). Only the power adapter gets hot with up to 53.2 °C under full load. (±) The average temperature for the upper side under maximal load is 32.7 °C / 91 F, compared to the average of 30.7 °C / 87 F for the devices in the class Tablet. (+) The maximum temperature on the upper side is 36.6 °C / 98 F, compared to the average of 34.8 °C / 95 F, ranging from 22.2 to 51.8 °C for the class Tablet. The two stereo speakers are located on each side of the display - being positioned on the front. This is good news in terms of their audio quality (with clean highs up to medium volume) although weak mids and bass as well as reduced clarity with increasing volume (sounding very damp and unbalanced in the end) damage this picture somewhat. 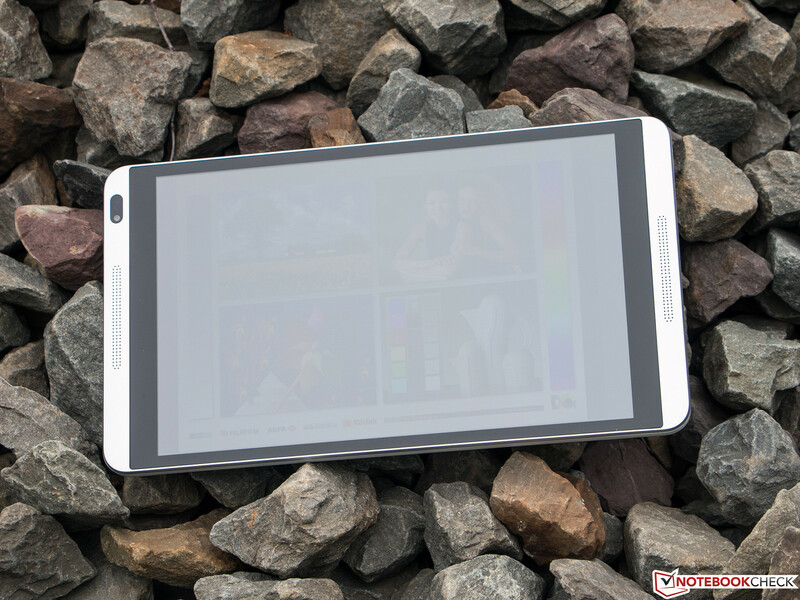 In terms of power consumption, the Huawei MediaPad M1 8.0 delivers on all fronts. Idle consumption levels of 0.8 to 2.8 watts are already decent, but 5.1 watts under full load is even better. Both the (rather fast) SoC and the panel seem not to be too power-hungry. The large 4800 mAh battery of the Huawei MediaPad M1 8.0 leads to a lot of real-life stamina, especially in combination with the low power consumption of the tablet. Our Wi-Fi test scenario sets the display brightness to 150 cd/m², deactivating all modems with the exception of the Wi-Fi module and browsing the web (with a script opening a new page every 40 seconds). 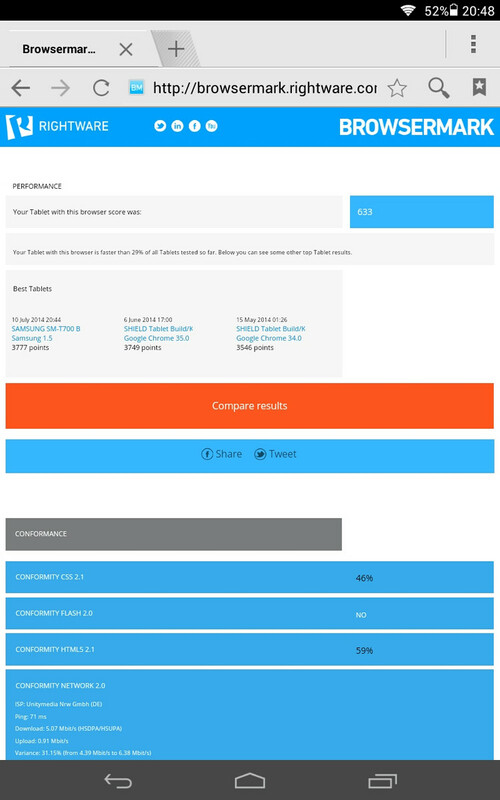 During this test, the MediaPad manages to survive for more than 12.5 hours - a great result, beating the entire competition, including the second-placed Lenovo A8-50 which yields more than 9 hours, far less. In review: The Huawei MediaPad M1 8.0. 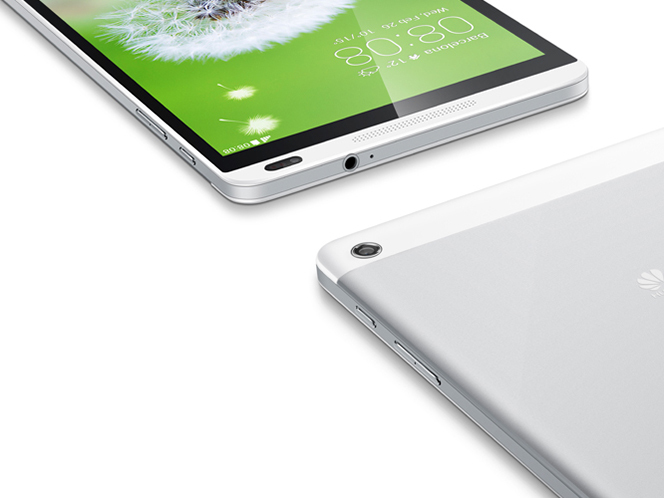 The MediaPad M1 8.0 can be had in gray and silver. The 8-inch display offers a resolution of 1280x800 pixels. The panel is protected by plastic. Two speakers can be found at the sides of the touchscreen. 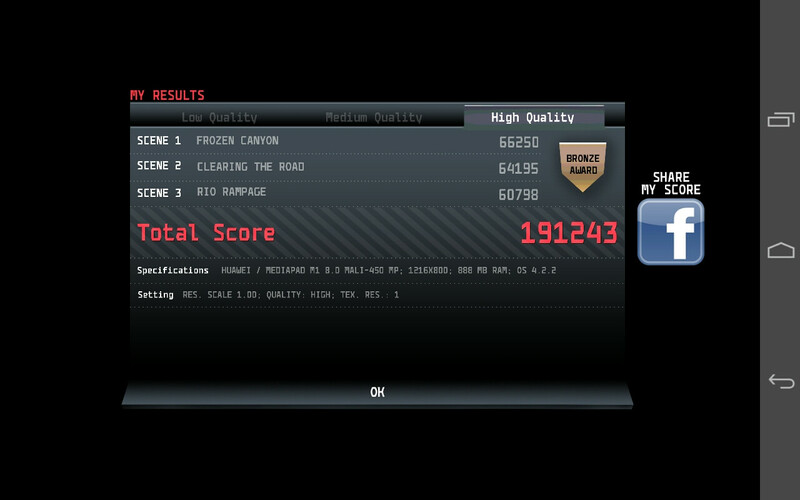 The Kirin 910 CPU yields decent performance levels. The tablet is rather lightweight, offering small bezels. Metal and plastic cover the rear. Dual-band Wi-Fi on such an affordable slate? 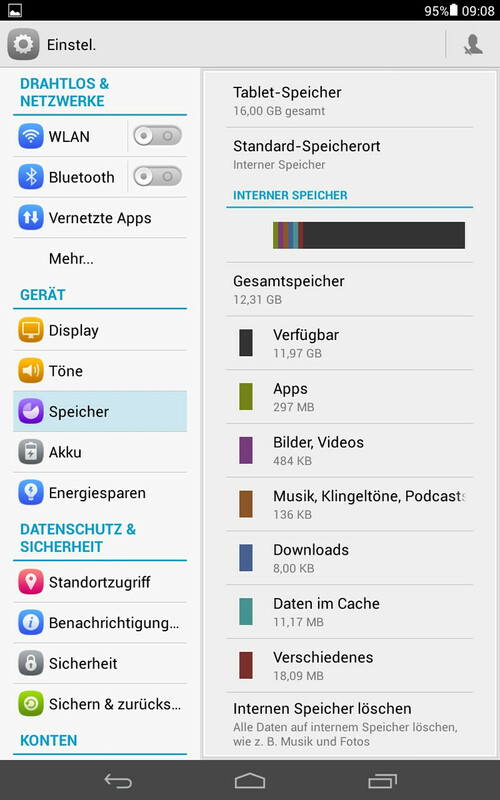 12 GB is available to the user. 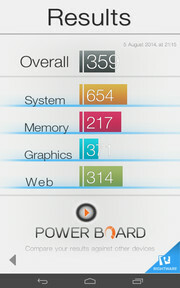 The battery runtimes of the MediaPad M1 8.0 are very good, beating those of many higher-priced devices. The tablet also comes in an LTE variant - so why didn't Huawei put more effort into outdoor visibility of the display? Some competitors are the Lenovo A8-50, the Samsung Galaxy Tab 3 8.0, the Acer Iconia A1-810, the Dell Venue 8 Pro and the Captiva Pad 8 Pro.